Raid: Shadow Legends is now available on Android and iOS. 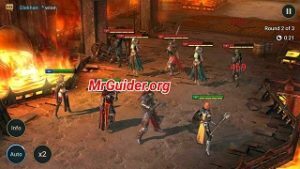 Published by Plarium Global Ltd., the game offers turn-based battle mechanics and a wide range of game modes including Arena, Dungeon, Campaign, Clan Boss, and more. This game is similar to other Gacha RPGs. If you have played games like Summoners War, Skylanders, then you can guess this package! The initial download size of Raid: Shadow Legends game is 90MB(approx.). After that, you will have to download the resources(700MB ~). On iOS, its download size 235MB(You may need to download additional file). You need an active internet connection to play this game. Let’s have a look at our Raid: Shadow Legends game overview. ⇒You will start from the campaign mode chapters. That’s the way to unlock more content in the game. In this mode, you progress through the chapters. In each chapter, there are loads of stages to complete. From these normal battles, you can earn artifacts, champions, silver, EXP. The player can play this mode in three difficulty modes; normal, brutal, and hard. ⇒As we mentioned above, Raid: Shadow Legends game offers turn-based battle mechanics. You can select up to four characters(even more in some modes). In the battle, the player uses the character’s skill to deal damage to the enemies. Building a balanced team and using the champions’ skills at the right time is the key to the victory. As you progress further, you will face deadly monsters. You will have to develop the champions by upgrading their rank, skills, artifacts, level. There are so many upgrades! Raid: Shadow Legends game features lots of game modes; campaign, arena, dungeon, and clan boss. We have already explained the campaign mode in the above paragraph. In the arena mode, players from all over the world battle against each other for the arena points and rank. To play arena, you need arena tokens. From the dungeon modes, you can earn scrolls, artifacts, potions, and much more(you need these items to develop champions). We have not tried the clan boss mode yet. You need to join a clan or create a clan to play clan boss mode. To create a clan, you need 250 gems. ⇒Raid: Shadow Legends features over 200 characters. Some are really useless while some are pretty good. All these characters have unique skills, different attributes, faction attachment, and combat style. You can add a variety of champions in the team; attackers, defenders, healers, supporters. All these characters are classified into five grades; common, uncommon, rare, epic, and legendary. ⇒You can get these characters through the summoning portal where you spend shards and silver. You can get shards(required to summon champions) from the dungeons mode and shop. Additionally, low-quality champions are dropped in the campaign battles. The graphics of the game are awesome; animations, character attacks, environment, characters, enemies – everything looks amazing. The controls are also good; you can play manually or turn on the auto-mode(if you are grinding, auto mode worths a try). You can use the Plarium ID or Facebook account to save progress. There is no reset function available. As of now, Google Play Games Login method is not available. The player can change his/her name only once. After that, he/she will need to buy name changer scroll from the shop. It will cost you 20 gems. Raid: Shadow Legends game’s main source of money is IAPs and monthly raid pass. IAPs include packs(rookie to silver). These packs contain shards, silver, gems, energy. The player can buy gems(Gem is the premium in-game currency that you can exchange for silver). You can also use these gems for boosters, clan boss keys, name change scrolls. There is another daily & progression bundle that offers premium shards(sacred, void), gems, XP booster, and a bunch of items. Raid Passes or monthly pass offers XP boost, Silver boost. The last one is LSO(Limited Special Offers); offers skill packs(tome), gems, and silver. The price range is (~$1 – $100). This game is not good for F2P players. The game offers a lot of advantages to the players who spend money. At the time of writing this post, it’s in beta. So things might change in the future. But, as of now, it’s completely P2W game. You can progress fast, get better characters if you spend. Other things such as graphics, animations, content are good. The battle system is the same as other games. We would rate is 2/5. Previous Post:BitLife Life Simulator Business School – How To Become CEO? Next Post:BitLife – Life Simulator Law School – How To Become Lawyer and Judge?